Former Syfy Channel PR guy Gary Morgenstein's (the mad PR genius behind Sharknado) new sci fi baseball novel A Mound Over Hell is set in 2098 following America's defeat by Islam in World War Three as baseball begins its final season ever. The first in The Dark Depths series, its been called "1984 Meets Shoeless Joe." America, now surrounded, has created a society based on love and ethics, led by Grandma, head of The Family. All acts of patriotism, from flying the flag to singing the National Anthem, are illegal. Social media has been banned under the Anti-Narcissism Laws. Religion, associated with Islam, is also illegal. Banks, lawyers, psychologists and the entertainment industry were banned by the Anti-Parasite Laws I and II. NEW YORK – November 30, 2016 – Who were the Marradians? Long forgotten, these ancient aliens profoundly shaped humanity’s evolution through inter-breeding and advanced science and technology. It’s a story that’s been suppressed – until now. Now on sale at Kindle, the new book series Ancient Aliens: Marradians and Anunnaki from acclaimed exraterrestrial expert Ilil Arbel, Ph.D, and science fiction writer Gary Morgenstein will, for the first time, reveal how the Marradians changed the course of mankind‘s history while battling their bitter rivals and cousins, the Anunnaki – with Earth the pawn in this galactic struggle. 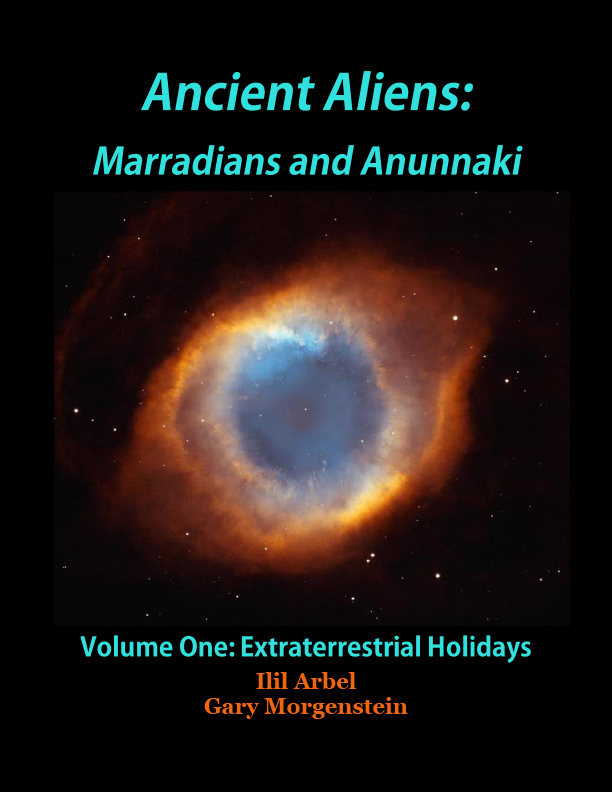 Playwright-novelist Gary Morgenstein and extraterrestrial expert Ilil Arbel's new sci fi book series ANCIENT ALIENS: MARRADIANS AND ANUNNAKI, about the mysterious aliens who are the parents of humanity, launches in early December. But we're providing sneak peeks ahead of publication. Here's the first part of Chapter One, Ashar Marrad, the Marradian Day of Thanks. The second part, recipes, will come out Monday: Roasted Litvakian Flying Turkeys anyone? You can also still read the introduction as well. Playwright-novelist Gary Morgenstein and extraterrestrial expert Ilil Arbel's new sci fi book series ANCIENT ALIENS: MARRADIANS AND ANUNNAKI, about the mysterious aliens who are the parents of humanity, launches in early December. But we're providing sneak peeks ahead of publication. Here's the introduction to tell you what it's all about! Chapter One will invade Earth on Thursday. August 17, 2015 (San Francisco, CA)—Inkshares, a start-up crowdfunded book publisher, announced today that the Nerdist, the wildly popular website, YouTube Channel, and podcast network founded by comedian and television personality Chris Hardwick, will be launching a collection on Inkshares. This collection will include books published under the Nerdist name, targeted at the Nerdist audience. Authors in the Nerdist collection will also have opportunities to develop their work into other media such as movies, TV series, and digital productions. Based on renowned author J.K. Rowling’s first novel for adults, the three-part miniseries THE CASUAL VACANCY debuts its first two parts back-to-back WEDNESDAY, APRIL 29 (8:00-10:00 p.m. ET/PT), followed by the debut of part three the next night, THURSDAY, APRIL 30 (8:00-9:00 p.m.), exclusively on HBO.